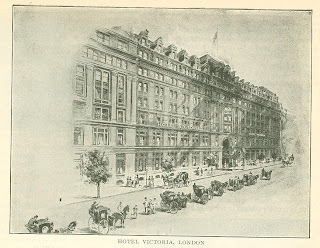 It is now twenty years since the first of the Gordon group, the Grand Hotel, Trafalgar Square, was opened. The Gordon Hotels now number five leading hotels in London, seven at English seaside resorts, and two on the Riviera - one at Cannes and the other at Monte Carlo. Many other new hotels have been started in London, some of them magnifi­cent buildings; but none of them have checked the uninterrupted prosperity of the Gordon Hotels. The pre-eminence which the Gordon Hotels maintain, and have always held, is due alone to excellence of management; to the careful way in which the comfort of visitors is studied, the determination always to have everything of the best. The Company has a capital of twenty million dollars, it has an annual profit of one and a half million dollars, its stock stands at double its par value on the Stock Exchange, and it pays a dividend of ten per cent. It has made hotel management a science, setting a splendid example to competi­tors, which all emulate but none equal. That is why the Gordon Company can view the establishment of new hotels with equanimity. People know what a Gordon Hotel is and what it means. Guests who once go to them always return, and there are people who find them so comfortable and homelike that they stop at them all the year round, moving from one to the other according to the season. The Gordon Hotels are managed on a system which, while they all work together, at the same time compete with each other; this must be so when we find three Gordon Hotels in one street. That is Northumberland Avenue, which runs between the Thames Embankment Gardens and Trafalgar Square. It is the most convenient site in London for hotels. It is within a few minutes walk of Westminster Abbey, the Houses of Parliament, within a short distance of the Royal Palaces, the theaters, the clubs, West End stores, Hyde Park, Rotten Row, and the fashionable centers of the West End. It is close to Charing Cross Station - the chief starting point for the Continent and central for the other railroad depots. 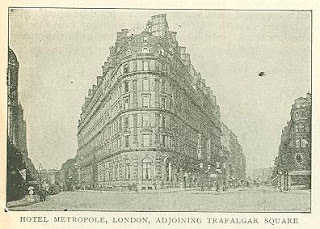 The Grand Hotel has a fine circular frontage to Trafalgar Square. It is patronized by the best classes of English aristocracy during the season. While it is the oldest of the Gordon group, it has undergone several important alterations which internally make it as convenient as any. It has recently expanded over a neighboring street, adding a large number of rooms to its accommodation. The Hotel Metropole, at the other end of Northumberland Avenue, is the largest of the Gordon Hotels. It covers an acre of ground, forms the angle between Northumberland Ave­nue and Whitehall Place. It can accommodate nearly a thousand visitors, and is remarkable for the spacious and sumptuous character of its public rooms. It has a great variety of private suites of apartments, from the elegantly furnished Marie Antoinette rooms, which have been frequently occupied by Royal visitors to London, to suites of bedroom, bathroom, and lavatory, which cost less than four dollars a day. The Metropole has long been a favorite stopping place for American visitors, who find that its size does not in any way detract from the excellence of the service in all its details. The magnificent central hall of the Metropole is one of the brightest and liveliest places in London. It should be noted that this and the other Gordon Hotels are admirably protected from fire, structurally and otherwise. 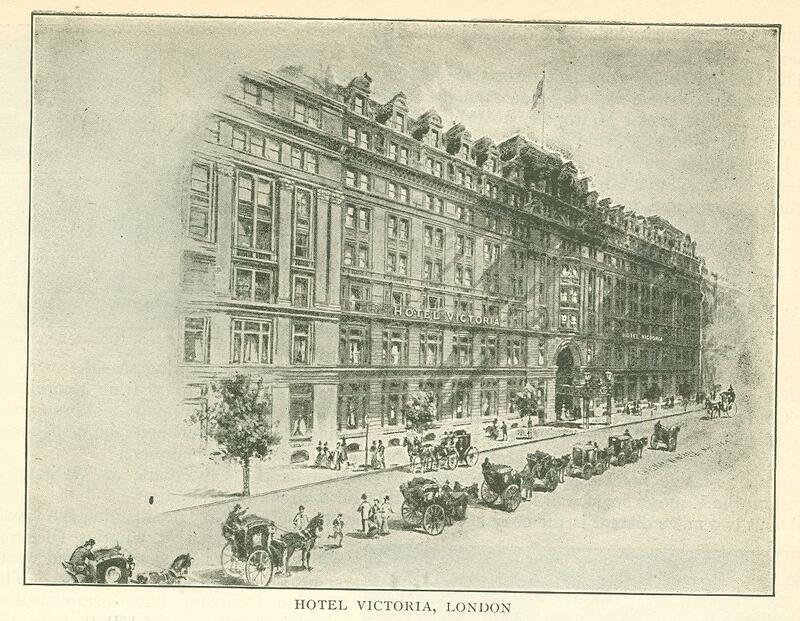 A few doors nearer Tra­falgar Square - is the Hotel Victoria, also a large hotel, while not equal in dimensions to the Metropole. The Victoria is also a favorite stopping place for American visitors. Its public rooms are smaller, but are very elegantly furnished and are exceedingly cozy. The Victoria has a spacious en­trance hall with walls of colored marble. The chief public rooms are luxuri­ously furnished and look out on Northumberland Avenue. The administrative offices - the Manager's Office, Cash Office, Reception Bureau, Theater Office, Railroad Office, Cigar Department, etc. - are conveniently arranged round the central hall. The interior arrangements of the note I have been cleverly carried out to afford guests every convenience and comfort. There are a number of suites of rooms with private baths attached. The Victoria will be found a very homely and comfortable hotel. There are regular hours for table d'hote meals in these hotels, but meals are also served a la carte at the option of visitors. Northumberland Avenue is the starting­ place for a number of coaching tours around London and the suburbs. The coaches start from the doors of the Hotel Metropole, Hotel Victoria, or the Grand Hotel. They run to all places of historic or picturesque interest around London, such as Hampton Court, Richmond, Kingston-on-Thames, Kew, and as far as Brighton, Windsor, and Oxford. The First Avenue Hotel, another one of the Gordon group, stands in High Halborn, which, with Oxford Street, forms one of the main arteries of London from east to west. While the First Avenue does not aspire to the palatial character of the West End Hotels, it is an exceedingly comfortable establishment, and the charges are more moderate than at the more fashionable hotels. It stands be­tween Gray's Inn and Lincoln's Inn, those old quaint quarters of the London lawyers, and within a few yards of the Hotel is the picturesque Staples Inn. It is also close to the British Museum, and is on the borders of the old City, the business center of the metropolis. The First Avenue Hotel is recommended for American visitors who prefer less style than has to be maintained at West End establishments. The Hotel is excellently fitted up with a large number of beautifully furnished rooms, and its public rooms include large billiard rooms with English, French, and American tables. The Gordon Hotels at seaside resorts are just as sumptuously equipped and are as fashionable stopping places as the Company's London estab­lishments. 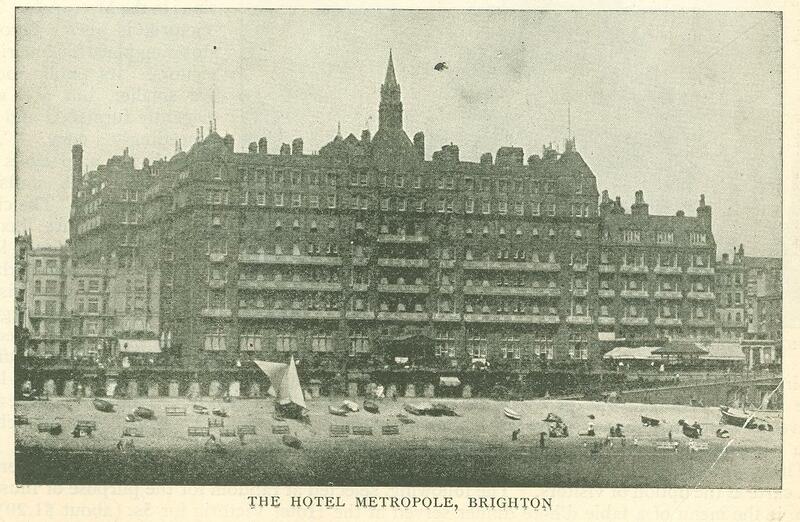 The Hotel Metropole, at Brighton, for instance, is perhaps the most magnificent seaside hotel in the world. It stands in the best position on the seafront of "the Queen of English Watering-Places," is a large and imposing building, with com­modious rooms and many special features which add to its attractions. It has a huge Winter Garden and conservatory, one of the best sets of Turkish baths in the country, while attached to it are the Clarence Rooms used for concerts, balls, etc. It is a very bright place at which to pass a holiday. 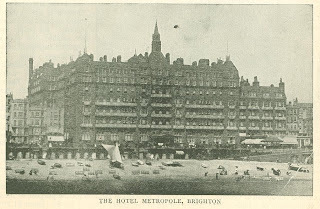 At Folkestone, which is one of the cross-channel ports, being on the way from London to Boulogne and Paris, the Gordon's Hotel Metropole is again the leading hotel. It has a fine position on the top of the cliffs in the west or aristocratic end of this growing seaside resort. Proceeding further round the coast, we come to Dover, on the other route from London to the Continent. Dover is exactly opposite Calais on the French side, and many visitors find it convenient to break the journey here to visit this interesting seacoast; and here again they find a Gordon Hotel - the well known Lord Warden, which is situated near the piers. Another seaside hotel owned by the same corporation is the Cliftonville at Margate, a resort on the Kentish coast well known for its mild and invigorating climate. About two miles distant is the cozy and picturesque seaside resort of Broadstairs, the favor­ite watering-place of Charles Dickens, where the novelist conceived and wrote some of his best known works. The Gordon Company have established a charming little seaside hotel here, the Grand Hotel, which was opened last season for the first time, and is patron­ized by people who love beautiful sea views at a quiet and restful resort. Another Gordon Hotel is found at the aristocratic seaside resort of East­bourne, which is a little over an hour's journey by train from London. East­bourne is a town which has been devel­oped by the Duke of Devonshire in a very select fashion. It is prettily situ­ated, the houses are all of the villa type, all its streets are lined with trees, it is beautifully clean and well kept. Only houses of a mod­erately high value are permitted to be erected. Eastbourne is an exceedingly healthy place. Further along the South Coast of England, in the Isle of Wight, the great center for yacht­ing, is still another Gordon Hotel, the Royal Pier Hotel, Ryde. This is a very fashionable resort during the yachting season. The Isle of Wight itself is a delightful holiday place with many interesting associations, besides the fact that it contains the Queen's residence of Osborne, and Carisbrooke Castle, where Charles the First was imprisoned. Ryde is the leading town in the island, and is the most convenient starting place for excursions in all directions. The place teems with objects of historical and antiquarian interest for visitors. It will be seen from the above brief survey that the group of Gordon Hotels form very important. institutions in England. There is a uniformity about the management, and a high standard is maintained which gives these hotels a character, position, and reputation of their own. Visitors seeking accommodation at any of them would do well to book rooms in advance by letter or cable and so prevent disappointment. Originally published in The Outlook Magazine. 1900.